Important Information and News » [Sticky] Seen something interesting? * We currently have three chicks - one pale yellow with two brown chipmunk stripes, one with a brown back, and one who's featheres aren't fluffed up properly yet! *There is an egg in the incubator pipping! Tired after exploring their brooder box! Aww look colour yay thankyou for the pics !!!!!!! Now this is a good thread. Go to the top of the Director's class that person. The colour snaps put such a different perspective on the viewing. Thank you so much and keep snapping. Is that a litter tray ??? Start 'em early - good idea according to my Mum. Do hope some one has told them.. Can see them having a little paddle/roll in that soon! Fun. They seem much more settled in the brooder than they were in the incubator with a those eggs to bash into. I was scared when I first saw the cam - all 3 chicks were together but not moving and I thought something terrible had happened! Thanks for the pictures Red, it was great watching #3 hatch last night - I hope you've recovered Vicki! Is the brooder close to the 'bator? Just wondered if a new hatchling would be able to hear its older siblings. Is the one chick quite small compared to the others? It seems very bossy but unbelievably cute! Now they're all moving - they are just the sweetest things. This has been the best Easter ever! How is the other pipped egg doing Red? Hello Red's cousin(?) what's your name? Hello Joe!! Nice to hear from you! Where's CC?! The Chief Chicken should be present at the birth of these babies!!! Rawr sorry im random and crazy ! Hi Joe - have you introduced yourself on the other thread yet? Is it you that plays football? The chicks are really sweet, they run about and then all of a sudden they go limp and flop as they fall asleep...! They do actually look a bit dead when they're asleep - it's given us a few scares but they're ok, they just flop! It'd be nice to be able to do that - especially at work. Just to flop, have 40 winks, and back up and raring to go! Number 4's arrived. Many thanks to Red, Neil, Joe, and Neil's mate for moving the camera so that we could watch it. Chickie 5 has begun zipping, it probably won't be more than a few hours now. Is chickie # 4 ok ? I WANT SOME CHICKS!! They're beautiful...I wonder if I can force Livia to become broody? You can do the opposite of all the stuff to discourage a broody. I think that leaving eggs in, and putting fake eggs in can encourage them, but it's not guaranteed. No, it wouldn't be fair; I've only had her a week, she's just getting used to life on our planet! There's also breeds that go broody very easily. Every pure breed is better at going broody than the hybrids. I think silkies go into it very easily, and bantams as well. You'll never get many eggs out of a good broody, but she'll hatch a load. I have a broody little bantam that is sitting on 7 duck eggs right now, because that's all she wants to do is hatch out eggs..so I'm giving her what she wants..she may be shocked when she finds out what strange looking little things she hatched out however. I'm sure she won't notice. Though with a bantam and ducks she may try mothering them long after they're bigger than her. Funny image. Hey Lynn, there was a story about a silkie who went broody so they put duck eggs under her. The silkie was a great mum, but when the ducklings were older and decided to go in the pond for the first time, the mother silkie panicked and thought they were drowning. She flung herself in the water in a desperate attempt to save them, and almost drowned herself! That's a great story Red, I hope Lynn's hen doesn't do that! 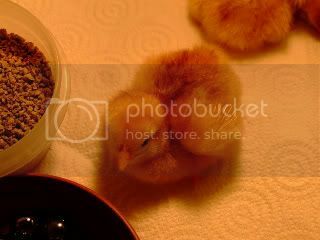 How long will the chicks stay in the brooder? I love the speed they fall asleep - its like someone flicked a switch to turn them off! The chicks will stay in their current brooder for about a week, then they'll move into a bigger one...we think we're putting them in a Winnie the Pooh paddling pool! Hee hee!! That'll be sweet!! Is it YOUR paddling pool Red?!! Nope not mine...I had a huge paddling pool i was planning to put them in, but it turns out my mum threw it away last summer *grumbles* So i'm borrowing my little cousin's and just hoping it'll actually fit in the study! What is the latest news on #4 & #5 please? Any chance of a peek at them? That would be great Red, hope others are on line and don't miss out. Did some one there say something out of turn? Maybe they took a vote and didn't like the whole world listening to their domestic chitter chatter. I wouldn't like the whole world listening to my domestic chitter chatter. Especially as I live by myself. I wouldn't want everyone listening to me either! It was lovely listening in today though and I'd like to say another big thank you for letting us be part of it. Wazza, I've not heard that term " toy boy" since 1970. My aunt's English husband had a brother come visit them and he was 1 year younger than me. Uncle Christoper arranged a blind date for me with his little brother ( before I had met Stan ). We went out alot and I got teased about having a " toy boy ". So once upon a time I was a toy boy's boy toy " but in a nice sweet cute way .... nothing naughty . LOl. Chickie 1 ~ The largest, already growing feathers on his/her wing tips. Dark brown feathers on back, light forehead. Loves to sleep in the food bowl!! 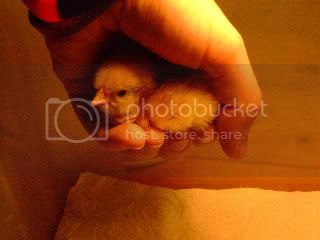 Chickie 2 ~ Dark head down to his face, light yellow everywhere else apart from two light brown stripes down his/her back. Chickie 3 ~ Yellow all over with some light brown colouring on his/her back. Chickie 4 ~ Looks like s/he will be identical to chickie 2 when s/he's fully dry: light yellow, brown on forehead with chipmunk stripes on back! Has a slightly darker beak than Chickie 2. 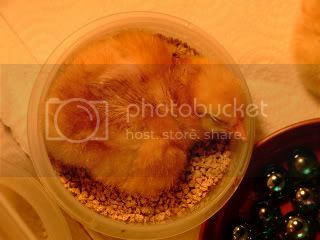 Chickie 5 ~ The little runt of the chicks! Smaller than the others, dark brown colouring on head & back. Also has a dark brown beak which the others love to peck at - poor little guy! aaawwwww is that # 1 ?? Thanks for the descriptions Red, doesn't help from a cam point of view, but its nice to know that you've logged which is which for future info! Are any other eggs pipping? I assume not as it hasn't been mentioned. How long do you wait to see if either of the others will hatch? One of the chicks keeps lying down and stretching its legs out backwards like its doing aerobics! No pips on any of the other eggs... so it looks like 7 failures. I've told Scarlet if she wants to she could pip them and see if anything was developing, I hate the idea of finding something dead in there, but the thought of something still alive but exhausted from trying to get out is even worse! The sound was off last evening because it freaks Helen out a bit, the complete lack of privacy... So I apologise for that but hope you understand! (I was at my nephews house watching the pitiful England v France match or I might have put up more of a fight for the sound to stay on!) I turned it back on when we went to bed so you had sound through the night and today. Scarlet... fresh kitchen roll please those chicks know how to make a mess! Too right - it helps with their growth too I'm sure! Its a hard call with the other eggs but I think you're right - it'd be like being buried alive if it couldn't get out through tiredness and it looks harder than human birth, for the baby at least! I don't blame Helen - if I video anything I won't speak as I don't want my voice to be heard. She's entitled to privacy in her own home! Sorry i was turning the dirt over in the big coop! Um...if i manually pipped the other eggs though, what the heck would i do?? See if anything was wiggling inside?! Don't know - anything on the internet about it? has the camera stopped working? Chick 1 is who I dubbed "Camera Hog"---big from the start! 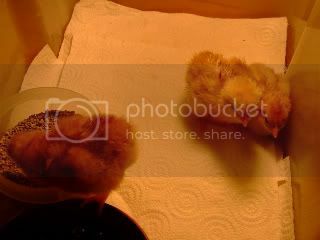 Chick 2 is the one I saw as darker, that is Cheeper! Noisy that first night! coloring that night....definitely Little One!! I guess Chick 5, whom I have to be introduced to and is smaller...needs a good ID name....MIDGET!!!!! Red, are you on the phone? Looking for a flashlight? I've got one handy...and a screwdriver, too!!! LOL!! Too bad I can't hand one over the cam!! Poor thing? A tumor? Did I hear correctly? I think you put sawdust down....NO PECKING, you say? LOL!!! Food back in and the chicks are peeping. They are SO CUTE!!! The HAND is hanging over the side........What little darlings they are! ....They ARE silly, Red, as you say...but don't give them a "silly complex." They are so impressionable at this age!! LOL!! when are you planning to introduce the chicks to milly, tilly and penny? Back from the walk...you still there, Red?? Oh, you messing with the water and chick is standing on it as you raise it up! LOL!!! No school today or is your cold keeping you home? Off to eat my breakfast!!! the chicks look so adorable, I wish I could hold them How many times do you have to change the kitchen towels?? They will peck each other. Chickens are social creatures after all and have their pecking order. do chicks at their age establish a pecking order now? I guess so. They can't all eat from the feeder at once (especially if someone's sleeping in it), so they will peck each other. At this age the chicks peck mostly for curiosity, or playing a game...there's no aggression in their pecking, they'll 'playfight' and run up and bump chests with each other, but won't establish an official pecking order until they're a few weeks older yet. when will they attempt to fly? Red, Could you candle the remaining eggs to see if there is anything solid inside , maybe. ? I do not know about chicken eggs... but snake eggs are pipprd by making a small incision and then gradually increasing it. That might not be possible since chicken eggs are hard shelled. If the eggs are not fertilized or not going to hatch or the chicks are dead inside... then they will soon stink or explode from the heat. Wow! Here's "The Hand" again. It makes me jump coming over the camera lens like that. Awww. All five are lined up in the # 5, like on the face of a dice piece. :D I forgotten about that technique of putting marbles in the water dish. How are the girls doing? Sorry to hear the others didn't make it. Glad you took the courage to find out. Will think of some appropriate words to say as you "dispose " of the remains. At least you got 5 strong healthy chicks and you know about the others now. Its just cuteness overload when we look at the cam now! What are the things that look like berries in the other dish?